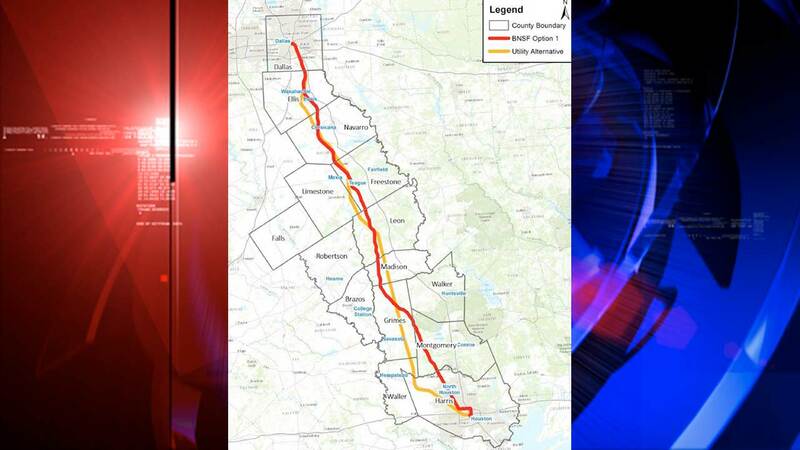 The proposed routes for the Texas Central High-Speed Railway. HOUSTON -- Former Harris County Judge Robert Eckels once again touted a proposed high-speed rail in Texas last week. Eckels spoke before the assembled members of the Cy-Fair Houston Chamber of Commerce at the Berry Center. Eckels previously held a similar presentation the the Tomball Chamber of Commerce. He is the president of Texas Central High-Speed Railway, a private, for-profit group looking to make high-speed rail a reality as soon as 2021. The controversial plan would link Houston and Dallas via high-speed trains developed in Japan. The trains would take passengers on a less-than 90-minute trip at 205 mph on the Houston-Dallas trip. It is projected that highway traffic between the two cities will continue to increase and by 2035 the current four-hour trip will take more than six hours by car.